Zander is an E-RYT 200 and YACEP, or Yoga Alliance Continuing Education Provider. Below you'll find a list of some recent workshop offerings. By bringing a meditative focus to the movements between the postures, the Vinyasa tradition teaches us to treat the journey and destination as one. In this workshop we will dive into two different but complementary transitional spaces. First, we will break down the elusive floating arm balance transitions often called “jump backs” and “jump throughs.” Learn how to build the strength and integration to perform these transitions safely with control. We will then implement the same principles to explore several of the more challenging arm balances. We will complement this through a meditative exploration of pranayama, yogic breathing exercises. The focus will be on the space between the breaths, known as the “kumbhaka" a gentle moment of stillness. When performed in a patient and safe fashion, this breathing practice leads to a unique mental clarity described by Patanjali in the Yoga Sutras. WHAT ARE WE REALLY DOING IN YOGA? Have you ever had that moment in the middle of your downward facing dog where you ask yourself: what exactly am I doing here? Is this a workout, a kind of physical therapy, a meditation practice or perhaps a form of art? What are these postures for? Join Zander as we explore these questions together in a guided group discussion. We will begin by examining what exactly is happening in the postures (asanas) before moving onto the even larger question: what is Yoga? We will reflect on both of these questions from a personal perspective, sharing experiences and insights, and survey the evolution of historical answers to these two big questions. Come prepared with your questions and experiences of yoga. Wear comfortable clothing as we will do some light postures, and bring a pen and journal or something to write on. Join Krystina Simes and Zander Winther as we lay out a foundation for a safe and sustainable handstand practice. We’ll move through a strong flow to find the required engagement and embodied awareness before taking our time to breakdown and practice the various elements of his challenging inversion. Expect to get sweaty, and have fun. Where does the word “hatha” come from? What does it mean to practice hatha yoga? Join Zander for a classical Yoga experience as we explore these questions. We will examine some influential hatha yoga texts including the well known Hatha Yoga Pradipika, and lesser well known but profound Yoga Yajnavalkya. We will then move through a yoga practice built upon the framework of these texts, integrating asana, pranayama, kriya, mudra and meditation. All levels welcome, dress comfortably for a practice and bring a notebook and pen if you’d like to take notes. Join Zander and Krystina for a powerful masterclass structured around safe and sustainable inversion play. Expect to sweat and have fun as we move through arm balances, handstands, and advanced transitions. *Power yoga experience required. Students should be able to hold plank, crow, extend arms straight in upward facing bow (wheel) and feel comfortable finding handstand against a wall. The Yoga Sūtras of Patañjali are arguably the most influential and authoritative text on Yoga philosophy. In just under 200 lines, it provides a vision and methodology for investigating the very nature of the self. Join Zander as we explore this profound work, laying out its philosophical structure and uncovering how to integrate its practices into your daily life and yoga practice. Dress comfortably and bring a pen and notebook. Whenever we take a class described as “power” “vinyasa” or “flow”, we are practising in the Vinyasa tradition of Shri Krishnamacharya, a fascinating yet mysterious 20th century Yogi. Join Zander as we explore the original meaning behind the word “vinyasa” and review the history of this powerful yoga tradition. We will look at its ancient roots, survey its most important philosophical texts and explore its development all the way up to the 20th century. Feel free to bring questions, and a notebook. In this workshop we will be diving into the logic behind the Ashtanga Vinyasa Sanskrit count. Have you ever wondered why we jump through on sapta (seven) for the seated postures, or why we repeat ashtau (eight) or nava (nine) during the closing section? 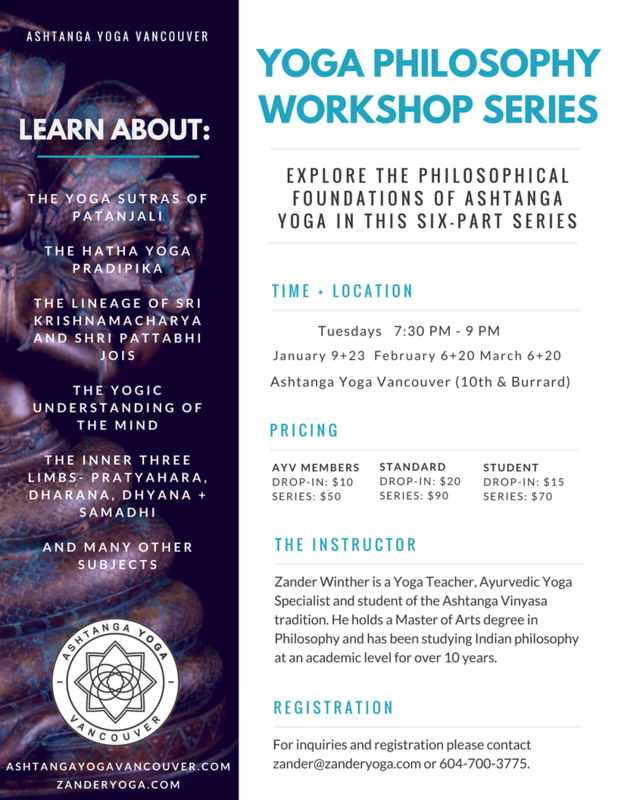 Join me at Ashtanga Yoga Vancouver for an introduction to this transformative style of practice. If you've been curious about the Mysore method (as the teaching style is called) but hesitated to get started, this is a great opportunity to get your bearings and ask any questions you may have. The Ashtanga Vinyasa practice is for everyone and can be adapted to your unique history and needs. Open to brand new practitioners and experienced Yogis who are interested in exploring the Mysore tradition. You do not need to be able to jump through your arms or touch your toes or anything else to practice Ashtanga Yoga. Also included: four days of Mysore style practice at Ashtanga Yoga Vancouver during the following week (Monday to Thursday). Also included is four days of Mysore practice with authorized teachers at Ashtanga Yoga Vancouver (Mon-thurs the following week). This workshop is registered for 2 continuing education hours with Yoga Alliance. Join Krystina Simes and Zander Winther for an exploration of the inner teacher. Our journey will involve three steps: first we will develop tools for carefully listening to the body, using our internal feedback to craft our alignment safely from within. By maintaining this clear inner dialogue with the language of sensation in the body, we can ensure a practice that lasts a lifetime. From there we will explore the subtle or energetic alignment that goes beyond the physical body’s external arrangement in space. This subtle alignment was the original language of Yoga, and it is a powerful tool for deepening our meditative experience of every posture. Lastly, we will tie this all together to map out how to create and maintain a self-practice for the days when you cannot get to the studio or need to craft something unique. Join Krystina Simes and Zander Winther as we layout a foundation for progressing intentionally and safely through challenging inversions, culminating in tools for building a graceful handstand. It is tempting to ‘muscle’ your way through these postures; instead we will explore an approach that maintains what the Yoga Sutras refer to as Sthira and Sukha. Sthira can be understood as ‘strength without tension’, Sukha is described as ‘relaxation without dullness.’ By maintaining these qualities in our postures we will find the balance of strength and grace even as we find ourselves upside down.